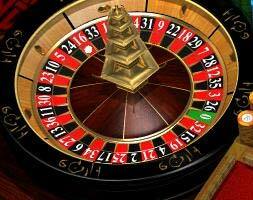 The European roulette table has 36 red and black pockets numbering from 1 to 36 and an extra green slot with number 0. Many players prefer this European version because it presents better odds of winning. Betting can be done on any of the pockets or combination of pockets numbers. The European roulette has very ease rules with a house advantage of 1:36 which is better than the one on American version. Straight up bet where you can place bets on one number. This option has a payout of 35:1. Split bet will enable you place bets on two bordering pocket numbers with a payout of 17:1. The street bet option enables you to bet on a specific row of 3 numbers with a payout of 11:1. With Line bet you can place bets on a set of 6 numbers with a payout of 5:1. Corner bet is a bet made on any 4 bordering pockets with a payout of 8:1. Zero is not used on the outside betting option. The bets place on this option must be up to table's minimum amount for betting. There are several types of betting styles in outside betting option. In outside Dozens bet, you place bets on three square numbers ranging of 1 - 12 or 13 - 24 and 25 - 36 and the payout is 2:1. Both High and Low betting options use two square combinations of numbers ranging from 19 - 35 and 1 - 18 with 1 to 1 payout. The Odd or even betting styles allows you to bet on an odd number or even number and it has payout of 1:1. The color bet enables you to place bets on red or black colors. This option will also pay you 1:1 ratio. The En-Prison rule is used by various casinos when a player places a bet and the ball rests on zero. The rule allows a second spin. However your bet amount will remain in the casino custody. If this happens twice you lose your money. You will get your money back if the ball does not rest on zero. But there is no payout for you. En prison has the smallest houseedge of 1.35% on even bet. The La partage rule dictates that if the ball hits the green color slot you lose half your bet money without an option of chancing on a second spin.